Success is all around us. And when the observant entrepreneur looks at others having success, they will learn a lot. That’s why today I want to share a story with you. The story of Darren Tabor, CEO of one of the leading ranking platforms for the digital marketing industry – FindbesSEO.com. When he entered the Twitter-sphere a few years ago, he started as any novice tweeter starts: basically, posting a few retweets of other users and some random thoughts here and there. His efforts were anything but consistent, and he didn’t see much to gain. Three months ago, Darren decided that it’s time to get serious about Twitter and invest some time in growing @findbestseo. He made an engaging Twitter bio and put a high-resolution banner that looks professional and reflects exactly what he wants FindBestSEO brand to be known for. “That was the easiest part,” he explained. Darren knew that with his hectic schedule he wouldn’t be able to keep his Twitter account active all the time. That’s why he decided to try a Twitter automation tool to help him keep his Twitter marketing on track. 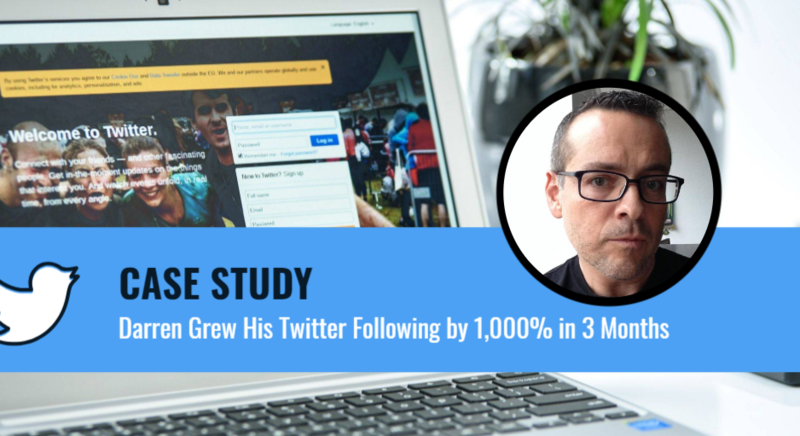 That’s how he found TwitterGrowth – a tool that automates some of the tasks and keeps his following growing without him having to waste time on tedious tasks like following and unfollowing. When he put TwitterGrowth to work, he had less than 5 followers. FindBestSEO currently has over thirteen hundred targeted and real followers on Twitter and the account continues to grow daily. That’s a total growth of over 1000%. But the rapid growth of the following base is just part of the equation. What matters most is the fact that Darren’s tweets are reaching more and more people that are actually interested in what he has to share. I asked Darren to give us a snapshot of his Twitter Analytics for June, 2018 and from what I see I would say his numbers are quite impressive. As you can see, despite the summer slum, the stats are growing strong. Darren is still at the begging of his Twitter journey. He has a lot to learn and need to tweak his strategy a bit in order to start seeing real business coming from Twitter. One of the best advantages of using Twitter for business is the ability to quickly and succinctly link to information. FindbestSEO audience is made up primarily of entrepreneurs, bloggers and companies who are looking to improve their search engine ranking. In order to be a continued resource, one of Darren’s goals for Twitter is to share helpful articles that would benefit them. By sharing relevant articles, facts, and quotes that would benefit and educate your audience, you have the opportunity to position yourself as an expert. Not only that, but when what you’re sharing is relevant and helpful for your audience, they’re more likely to retweet it and share it with their audience, too. TwitterGrowth tracks 15 million social media signals daily. The A.I.-powered keyword engine not only finds the Twitter users most likely to engage with you, based on the event hashtags they’re Tweeting, but it also suggests relevant tweets to interact with. Thanks to this, Darren will be able to keep his tweets trendy and relevant without spending time for research. Time involved: less than 5 min a day. To stay top of mind with your followers, you need to post multiple times per day. That may seem like a crazy number of tweets, but Twitter is a fast-paced social media platform. Each tweet has a lifespan of about an hour before it gets buried underneath new posts. It’s important to tweet several times each day in order to be seen by your audience. Darren currently tweets once or twice a day, but that’s not enough. He should try to up his game. The more he posts, the better results he will receive. To achieve this goal, the best approach is to take advantage of a scheduling tool like SmartPublisher. It will make it easier for himself to schedule and re-schedule all posts ahead. Photos catch the attention of more people when they’re scrolling through their Twitter feed. Tweets with images get 150% more retweets, 89% more favorites, and 18% more clicks than those without. Darren plans to use DesignPro – a drag-and-drop graphic design tool with more than 2,000 pre-made design templates divided into business industry, events, holidays, quotes, etc. to create visual posts that will grab the attention of his followers. I would highly recommend repeating Darren’s story. DigitalOcto can help put your Twitter account on autopilot and it works. The data above reveals the number of new followers, likes, retweets and link clicks received thanks to it. I’m convinced that if you apply this simple strategy to your own Twitter profile, you’ll see similar results.